A big part of Expedition 360 happens in a small corner of one of the labs on F Deck. 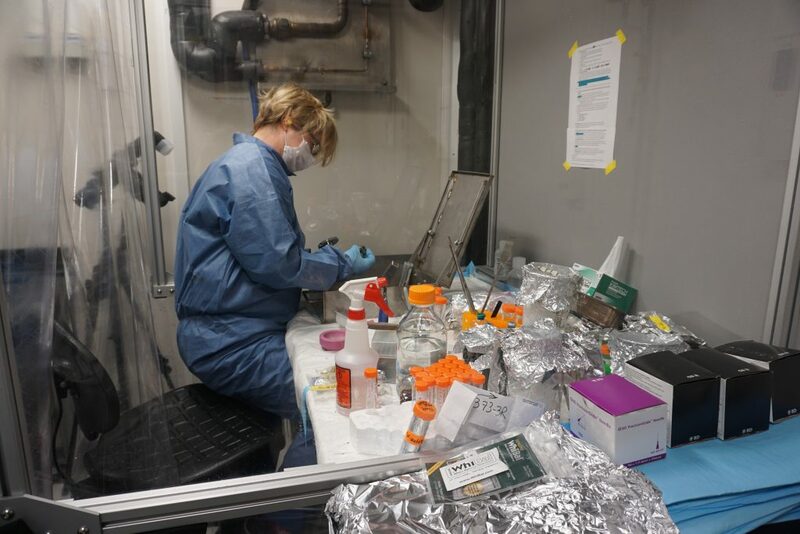 Here you can always manage to find one of our resident microbiologists, Virginia Edgcomb or Jason Sylvan, on the hunt for microbes. Ginny and Jason’s job starts when the announcement of “Core on deck!” comes over the intercom. They suit up and make their way upstairs to the core lab. Ginny and Jason are the first to get their hands on the rock. The Expedition 360 team does their best to reduce the risk of contamination and Ginny and Jason wear masks so that no foreign microbes come in contact with the piece of core. Jason Sylvan holding a piece of recovered core. When they choose a core Ginny says they look for any area that could have been exposed to water. This could be a good home for microbes. They bring the core to their clean room and begin to chip away at the rock in order to get to the stuff on the inside. Anything at the center of the core has not been exposed to drill fluid on its way back up to the JR and will provide them a pristine sample of rock. From here they will crush the samples taken from the inside and add them to various aqueous solutions that target growth of different groups of microbes. Then they will also try to grow fungi using a solid medium. Some of the samples are also used to look for DNA, which tells us who is living in these rocks, and for counting how many microbes are present.